Did you use moleskin on the edge? Looking forward to the pictures of the most successful collar. If you can also give the dimensions in inches/centimeters, that would be helpful (overall diameter, width of collar). Also the weight of your guinea pig and perhaps an idea of how loose it can be (can you get a little finger between the collar and neck? did you measure the throat and work from there?). I take it this is a flexible plastic. Is it a preformed collar the vet had? Is the newest collar comfortable fairly quickly? How long is it left on? It is held together with tape? I second your use of this under veterinary supervision. If we have some useful tips to give people, it will make a difference. Let me know if I can copy your photos permanently here. I may make up a reference thread for the Records board ( gl/records ). The most useful thing to me looking at your pictures is the application of lots of padding near the throat area. If you can get a photo of your pig sleeping with this on, that might help too. "Mineral oil can actually dissolve tissues over time." Really? I haven't heard that before. What's that based on? I haven't heard it, either, Sef. I know that it can cause problems, particularly when taken orally. It can interfere with vitamin absorption, and cause other deficiencies. It also can cause dermatitis if used too long/frequently on the skin. Maybe that's what is meant by "dissolve tissues." I'll try to answer all your questions and yes, please feel free to use any photos I post in your reference section. I'm not sure of dimensions at the moment, but as soon as Pig isn't using the collar I will measure it properly and will let you know - he is due to have it on for at least another week though, maybe 2. Pig is 1.1kg, but carries most of his weight around his bottom! In terms of how tight to put it on, this is a tricky balance - too loose and he can shake it off (happened on Wednesday), too tight and it will chafe his neck. As width of the new collar is bigger, I can afford to have it slightly looser, I can easily fit my middle finger under it (I do have fairly small hands though). The first collar was the same kind of plastic that you get on a bound presentation. The second collar is a modified rabbit (I think, possibly kitten) collar that has been cut down. The whole thing is held together using surgical tape which is padded. 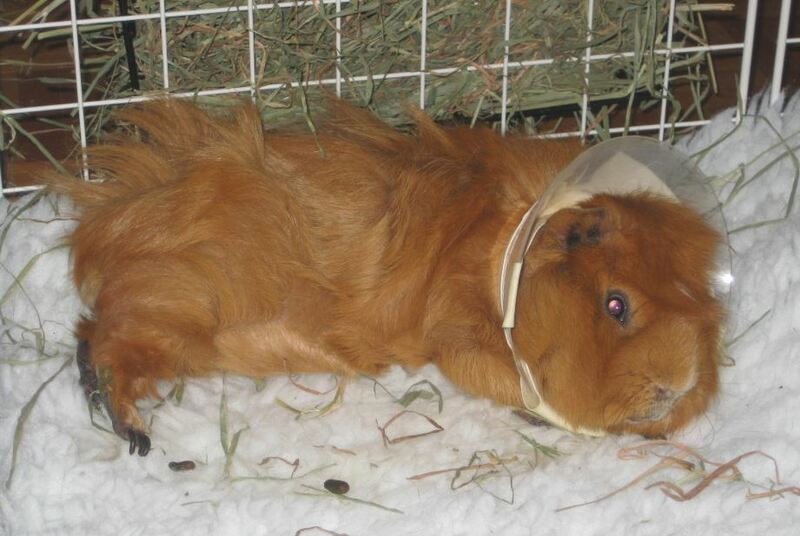 Pig went pretty wild when the collar was first put on him - lots of charging about and scrabbling for about an hour. It was very upsetting (for both of us) but he did calm down and within a few hours was acting normally. The longest it has been left on for is 2 weeks, but it may be for as long as 3 this time around as we want to make sure the surgical scars from the neutering are fully healed before I give him a chance to get at the area. As the collar restricts natural behaviour, Pig does need extra attention from me in the form of the occasional bum bath, as well as mouth and eye cleaning. 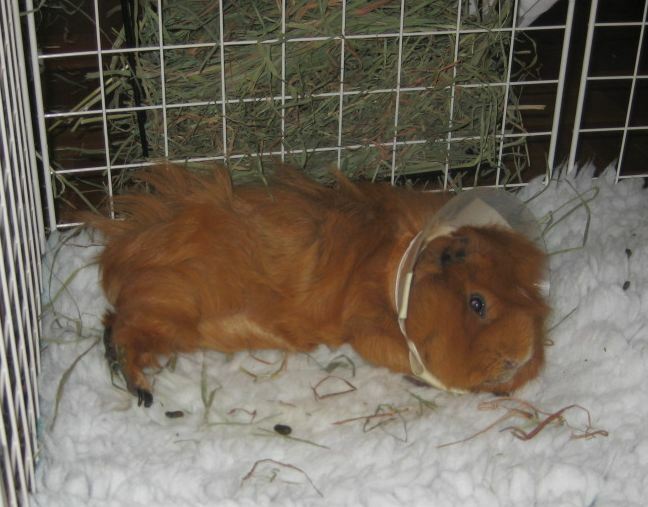 Getting comfy is also a bit of an issue for Pig, but he does still manage to relax with the collar on (he's not asleep in this picture, but he was before I took it - my rustling around woke him up). Thanks. I added your photos. When you can add the rest of the info, I write up a quick reference thread. Poor Pig. But he does look adorable with the collar on. That's a good design. I'm very glad to see it be successful. This will be an excellent reference. Re: mineral oil -- perhaps "dissolve" is too strong a word and I should have chosen better. Soften, or degrade, might have been better. I will say that before I started spending much time on GL, a long time ago, we would use mineral oil in a thin coating on the perianal sacs of males post-cleanout if impacted. Over time the mineral oil seemed to become goopy and the delicate tissues of the sac seemed to become sticky, almost friable. This takes a long time. I would still use it occasionally or for the short term, just not as a regular application. We quit using it when we stopped to think about what it does to adhesives. Think about what it does if you use it to remove a sticker or tag you're trying to get off a bottle or jar or something. It seemed to be doing something comparable to the sac tissues. Ah, got it. I've never really been a big fan of mineral oil, anyway, but guess I didn't realize it had a corrosive effect over time. Makes sense, though.